There is no doubt they have enough experience under their belt and enough hit songs to grant them this small desire, and as they said in the interview, it is up to the public to choose to call them artists or not. To woo their fans of whom they are making this title change request, SNSD has been keeping up with their selcas and making sure the recent ones have greater artistic flair than usual. Nothing says “artistic” in the K-Pop world like good airport fashion, or in this case airplane fashion. Tae-Yeon and Tiffany showed off their cute style while sitting in their seats on a plane together. Tae-Yeon showed off her artistic flair with a long scarf bunched around her neck and Tiffany went for a more punk-art style with her pink animal print sweater and big glasses. Although the girl’s faces and poses were the usual cute fare, it is clear they are trying to inject more maturity into their clothing. In another vein of artistic expression, Jessica updated fans with a selca of herself making a series of different faces. Anyone familiar with the entertainment industry knows that having a big range of facial expressions at your disposable is key to being successful. Jessica showed off an impressive range of happy, silly, serious, and skeptical in the photos, all while enjoying a beverage. As an artist, having many emotions and being able to express them through your work is key, so it is good to see Jessica accessing that part of herself. 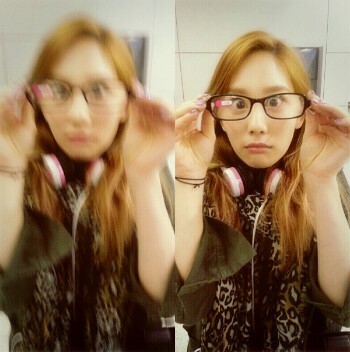 Last, but certainly not least, is Tae-Yeon’s recent solo selca of herself with giant glasses. She stated in her caption that she was a nerd like Edna, a very artistic character from the kids move The Incredibles. Not only did Tae-Yeon look artistic in her leopard print scarf and army-green jacket, she is also emulating a character that is a genius of artistic fashion design, perhaps a realm Tae-Yeon wants to get into? Fans were pleased with the picture and called Tae-Yeon “nerd beautiful,” which is certainly a step in the artsy direction. Hopefully we can continue to see this artistic side of SNSD through their selcas and hopefully it will carry over into their concerts and albums as well, finally gaining them the title of “artist” from their fans. What do you think, readers? Do you see the artist in SNSD?